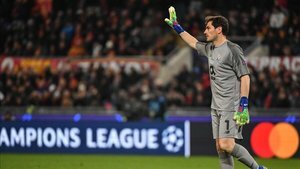 Iker Casillas announced on the show El Dia Despues that he will extend his deal with a Porto by another two years, taking him up to the age of 40. The Portuguese club have since confirmed the former Real Madrid goalkeeper's contract renewal on Twitter. "I'm going to renew with Porto for two years," Casillas revealed. "The president insisted that I signed terms until I am 40." Casillas is in his fourth season with Porto, who will face Liverpool in the Champions League quarter-finals next month after knocking out Roma. His new terms take him up until 2021. He's conceded just 25 goals in 37 games this season. Porto president Jorge Nuno Pinto da Costa declared that "Iker Casillas is a global figure in football and is also a figure at Porto."